that supplies the brain. In most feliforms (except nimravids and the extant Nandinia) the bulla is divided into two chambers by a bony septum, the anterior chamber composed of ectotympanic and rostral entotympanic, and the posterior chamber made by the caudal entotympanic (Hunt and Tedford, 1993). The ICA is reduced or absent, the primary en-docranial blood supply instead coming through the external carotid via a pair of arterial networks (or retia; Hunt, 1974b). Caniforms have a bulla with a single chamber and no septum (except in canids, which have a partial septum), and the blood supply to the brain comes through the ICA. Unfortunately the bulla of miacoids is unknown, hence we lack this important criterion for establishing relationship to feliforms or can-iforms. However, indentations in the basicranium of some recently described skulls of Bridgerian and later miacids suggest the presence of a loosely attached compound bulla (either ossified or cartilaginous) consisting of ectotympanic and entotympanic elements (Wesley-Hunt and Flynn, 2005). Also distinctive of extant carnivorans is a large braincase, with the coronal (frontal-parietal) suture situated well behind the postorbital constriction, owing to cerebral expansion (Wyss and Flynn, 1993). Miacoids differ in having relatively smaller brains, and a more anterior coronal suture. The skeleton of terrestrial carnivorans is usually relatively generalized, but is sometimes overprinted with specializations for climbing, running, or digging. The feet tend to be conservative, typically remaining pentadactyl, and the posture is plantigrade or digitigrade. A fused scapholunate in the carpus is a diagnostic trait of extant carnivorans, but the two elements remain separate in most miacoids. Similarly extant carnivorans lack a third trochanter on the femur, but it is present in miacoids. Marine carnivorans (pinnipeds) show major limb modification or reduction. Unequivocal Carnivora, as indicated by the presence of the P4/Mj carnassial pair, are first known from the Paleocene of North America. These earliest carnivorans belong to two primitive families, Viverravidae and Miacidae, often grouped as the paraphyletic Miacoidea (but formerly considered subfamilies of a stem family Miacidae). Several members of both families were also present in Europe during the Eocene, whereas only a couple of miacoids are known from the Paleocene-Eocene of Asia. By the end of the Eocene miacoids had disappeared everywhere and were quickly replaced by more modern carnivorans. Most miacoids ranged from weasel-sized to a little larger than a fox, or roughly 100 g to 10 kg. Miacidae, in the strict sense, are characterized by retention of third molars (a primitive trait) together with reduction or loss of the parastyle on P4 and loss of calcaneo-fibular contact (derived traits). They share these features with caniforms. In Viverravidae the third molars are absent, the parastyle on P4 strong, and the fibula articulates with the calcaneus—features in common with feliforms. Based on these criteria, the two families have been considered to be the earliest representatives of the two major clades of extant Carnivora (Flynn and Galiano 1982; Flynn, 1998), although definitive evidence from the basicranium is lacking. In addition, most (but not all) miacoids have separate scaphoid and lunate bones in the carpus; fusion of these elements is often considered a diagnostic trait of Carnivora. Consequently, Viverravidae and Miacidae are currently considered to be stem taxa that lie outside the two crown clades of Carnivora (Wyss and Flynn, 1993; Flynn and Wesley-Hunt, 2005; Wesley-Hunt and Flynn, 2005). According to this view, Viverravidae is the sister group of all other Carnivora (making the loss of third molars in this family an autapomorphy), whereas the paraphyletic Miacidae are probably closer to the crown clade. Uintacyon; Fig. 8.10F). However, if Carnivora is mono-phyletic, they must have existed much earlier (at least as early as the oldest viverravids). 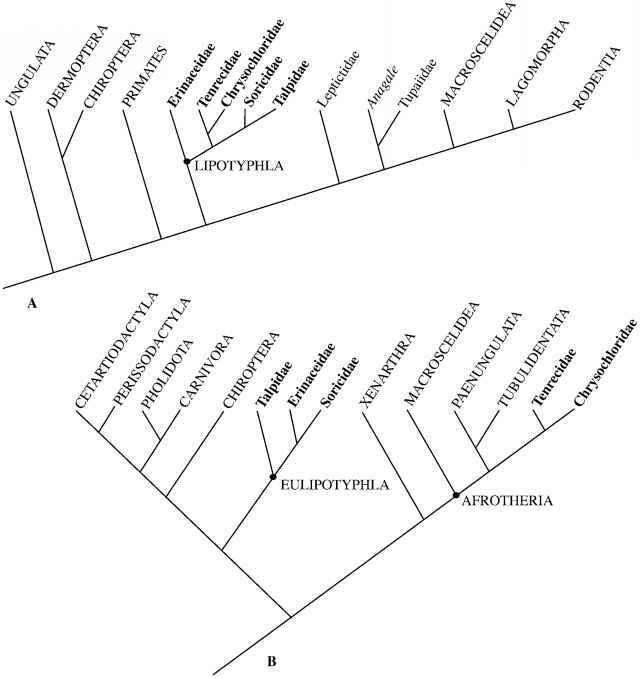 This early origin would presumably hold true even if Carnivora is not monophyletic and the two families arose independently from Cimolestes (which is known principally from the Cretaceous and early Paleocene). At present, however, there is little fossil evidence to favor this interpretation over a common origin of miacoids. Besides their dichotomy in dental formulae, viverravids and miacids also differed in locomotor adaptation, as reflected in their appendicular skeletons (Fig. 8.11). Many features in the limbs of viverravids, such as early Eocene Didymictis, indicate that they were terrestrial and probably incipiently cursorial, although they probably retained the ability to climb, not unlike extant Viverra (Heinrich and Rose, 1997). These features include a prominent greater tuberosity reduced deltopectoral crest, supratrochlear foramen, and wide radial head in the forelimb, and a posteriorly directed lesser trochanter, well-defined patellar trochlea, moderately grooved astragalar trochlea, narrow and more elongate cal-caneus, smaller and more distal peroneal tubercle on the calcaneus, and several other tarsal characteristics in the hind limb. Miacids, however, were adapted for scansorial and arboreal habitats. Vulpavus (Fig. 8.12) and Miacis resemble living palm civets and coatimundis in having a sharp deltopectoral crest, shallow humeral trochlea and olecranon fossa, round proximal radius, medially directed lesser trochanter, shallow patellar groove, and nearly flat astragalar trochlea (Heinrich and Rose, 1995, 1997). Most of these features are associated with increased joint mobility, as would be expected in arboreal animals. Both miacids and viverravids had relatively short, laterally compressed terminal phalanges. Most authorities agree that miacoids were the source group for more advanced feliforms and caniforms. However, transitional taxa or plausible ancestors for most of the modern families have not been identified. Canidae, which can be derived from Miacis or a closely allied form, is an exception, as discussed below. Palaeoprionodon, best known from Quercy, is the oldest feliform with viverrid ear structure (Hunt, 1989, 1998c). Viverrids, an Old World family that includes the extant civets and Asian palm civets, are generally considered to be primitive feliforms. Stenoplesictis (Fig. 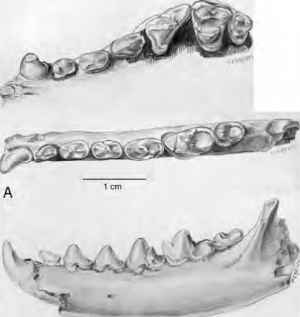 8.13A), from Quercy and probable late Eocene deposits of Alag Tsab, Mongolia, has been regarded as the oldest viverrid, based on dental resemblance (e.g., Dashzeveg, 1996). However, its auditory region, although clearly two-chambered and therefore feliform, differs from that of both viverrids and felids; hence Stenoplesictis has been considered a stem feliform (Hunt, 1991, 1998c; Peigné and Bonis, 1999). The oldest viverrid-like skeleton is that of Asiavorator (Fig. 8.13B) from the early Oligocene of Mongolia. 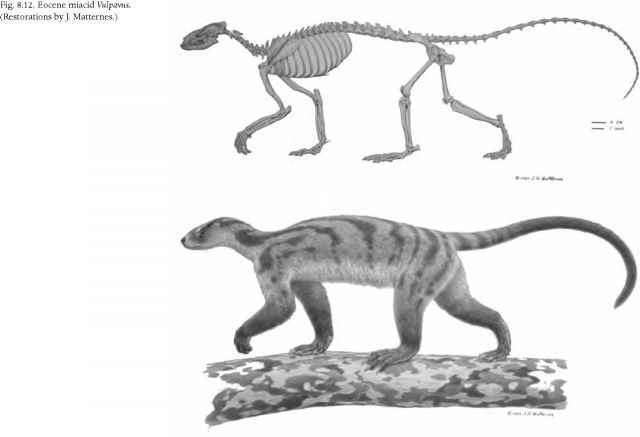 It closely resembles that of extant civets and genets and was primarily terrestrial but probably retained the ability to climb trees (Hunt, 1998c). The earliest felids also come from Quercy Proailurus and Stenogale (Fig. 8.13C,D), known from jaws at Quercy (but no recognized ear regions), can be confidently identified as felids, based on the derived petrosal anatomy of early Miocene representatives (Hunt, 1991, 1998c). Although Proailurus has long been recognized to be a felid, prior to Hunt's study Stenogale was usually identified as a viverrid or a basal feliform. In these basal felids M1 has a well-developed shearing blade formed by the tall paraconid and protoconid and intervening carnassial notch; the metaconid is already reduced or lost. The early radiation of felids took place in the Old World; they did not reach North America until well into the Miocene. The close resemblance among these early feliforms indicates that felids and viverrids are sister taxa. 1988; Bryant, 1991). Most recent studies ally them with feloids, based on the reduction of posterior molars and possession of hooded terminal phalanges that bore retractile claws (e.g., Hunt, 1987; Bryant, 1991; Wyss and Flynn, 1993; Martin, 1998; Flynn and Wesley-Hunt, 2005). Nevertheless, nimravids differ from felids and most other feliforms in several cranial details, including having an essentially single-chambered auditory bulla with a uniquely formed anterior septum, a caudal entotympanic that is only partially ossified, and a different conformation of basicranial foramina (Hunt, 1987). Their origin remains obscure. The earliest nimravids, Dinictis and Hoplophoneus of western North America, were already saber-toothed, with large, serrated, and laterally compressed upper canine teeth and a protective bony flange on the mandible. Some species reached the size of cougars or jaguars (about 100 kg). Hoplophoneus was short-legged and more like an ambush predator, whereas Dinictis had longer limbs and was more cur-sorially adapted, like living pursuit predators (Martin, 1998). It is likely that they were also able to climb trees. These early nimravids (subfamily Nimravinae) became extinct by the beginning of the Miocene, perhaps partly as a result of the spread of grasslands (Bryant, 1996). They were succeeded in the late Miocene by barbourofeline nimravids and saber-toothed felids. Late Eocene and Oligocene Palaeogale (Fig. 8.15) may also be mentioned here. Long considered a primitive mustelid, this widespread Holarctic taxon is now thought to be a basal feliform (Baskin, 1998) or possibly even a viverravid (Hunt, 1989). Like other feliforms, it has a bladelike trigonid on M1, but it differs from feliforms in having a single-chambered bulla. The third molars are lost and the second molars are very small or absent. Palaeogale could be a pivotal form in the early radiation of modern carnivorans. evolved in the Old World and dispersed multiple times to North America. North America for all of their early history, not reaching the Old World until the latest Miocene. 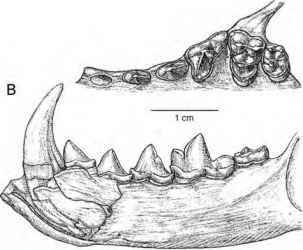 The oldest and most primitive canids are the hesperocy-onines of the late middle Eocene (Duchesnean) to the middle Miocene (Barstovian). They resemble certain species of Miacis or Procynodictis closely enough—especially dentally— to suggest an ancestral or sister-group relationship (Wang and Tedford, 1994; Munthe, 1998; Fig. 8.16), making Canidae the only modern carnivoran family that can be linked to a specific miacid. habit but incipiently cursorial as well. Hesperocyon appears to be broadly ancestral to most later lineages of canids. 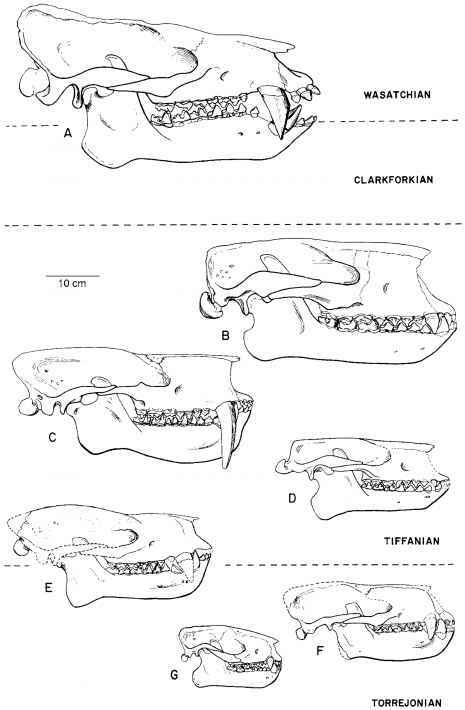 These include a diversity of closely related Oligocene hes-perocyonines as well as the borophagines, or "hyaenoid dogs," whose earliest representatives (e.g., early Oligocene Oxetocyon) had bunodont, hypocarnivorous teeth similar to those of procyonids (Munthe, 1998). Chadronian Prohesperocyon lacks the partial intrabullar septum characteristic of Hesperocyon and all other canids. 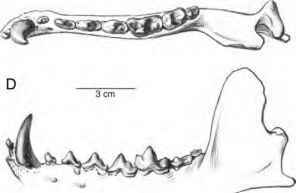 Its dentition approaches that of the miacid Procynodictis more closely than that of Hesperocyon or any other canid. For these reasons Prohesperocyon is considered the most primitive known canid and the sister taxon of all other canids (X. Wang, 1994). The bears (Ursidae) and bear-dogs (Amphicyonidae) are carnivorans that are sometimes united in the Ursoidea, which first appear in the Duchesnean and Chadronian of North America. Both families are usually regarded as arctoids, but the phylogenetic position of amphicyonids remains ambiguous. Parictis (Fig. 8.17A), a rare, primitive arctoid from the Chadronian and Orellan of North America, is usually considered to be the oldest known ursid (Hunt, 1998a). 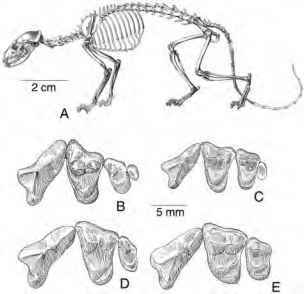 Although bears today are among the largest terrestrial carnivores, Parictis was small ( 2 kg). Like ursids, it had a primitive dental formula except for the loss of M3, robust premolars, and broad, relatively low-crowned molars with large basins. In Europe, the closely related Amphicynodon (Fig. 8.17B) from Quercy (not to be confused with amphicyonids; see below) had similar dental features and also seems to occupy a phylogenetic position near the beginning of ursids. The relationships of these taxa continue to be problematic, how ever. Parictis has been considered to be a canid (Scott and Jepsen, 1936), a member of a new ursoid family Subparic-tidae (Baskin and Tedford, 1996), and even a basal pinniped (Phocoidea; McKenna and Bell, 1997). Cirot and Bonis (1992) regarded Amphicynodon as a stem arctoid, possibly near the origin of both ursids and musteloids. Identification of Parictis as a primitive pinniped is not as surprising as it may seem, because the basicranial and car-nassial morphologies suggest that pinnipeds evolved from an ursid (Hunt and Barnes, 1994). Pinnipeds are otherwise unknown until the Miocene, however, and their precise origin is uncertain. A recent molecular analysis placed pinnipeds as the sister group of musteloids (Flynn et al., 2005). Aside from amphicynodonts, the ursid radiation took place primarily later in the Cenozoic (Miocene and thereafter). The only exception is Cephalogale, the oldest member of the hemicyonine ursids, which first appeared in the late Eocene of Asia and the early Oligocene of Europe (McKenna and Bell, 1997). Unlike other bears, which modified their dentition for omnivory, hemicyonines retained well-developed carnassials and did not elongate their molars (Hunt, 1998a). 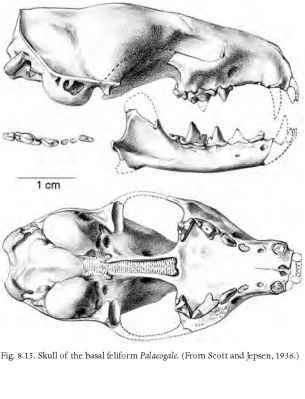 Amphicyonids, or bear-dogs, first appear in the late middle Eocene (Duchesnean) of North America and slightly later in Europe. The oldest North American form is Daphoe-nus (Figs. 8.17D, 8.18), best known from the White River Group of the mid-continent; Cynodictis from the latest Eocene of Quercy is the oldest European form. Amphicy-onids rapidly became widely distributed. Several lineages, representing three subfamilies, evolved from these two genera by the end of the Eocene (Hunt, 1998b). These early representatives were small (< 5 kg, no bigger than a small fox), but some later amphicyonids reached 200 kg. the flexibility expected in a climber (Hunt, 1996). It is believed that this skeletal form gave rise to both more cursorial types and more robust, bearlike forms (Hunt, 1998b). ever, consider Mustelavus and Mustelictis to be synonyms of Pseudobassaris, the oldest known procyonid (Wolsan, 1993; Wolsan and Lange-Badre, 1996). Skulls of the latter from Quercy, however, have an inflated, single-chambered audi tory bulla and a deep suprameatal fossa like that of procy-onids, whereas the suprameatal fossa of Mustelictis is shallow. Consequently, Mustelictis, at least, appears to be distinct from Pseudobassaris. ALTHOUGH THE TERM INSECTIVORA and the vernacular forms insectivoran and "insectivore" are widespread in both popular and scientific literature, they have been used to refer to very different associations of euthe-rians. 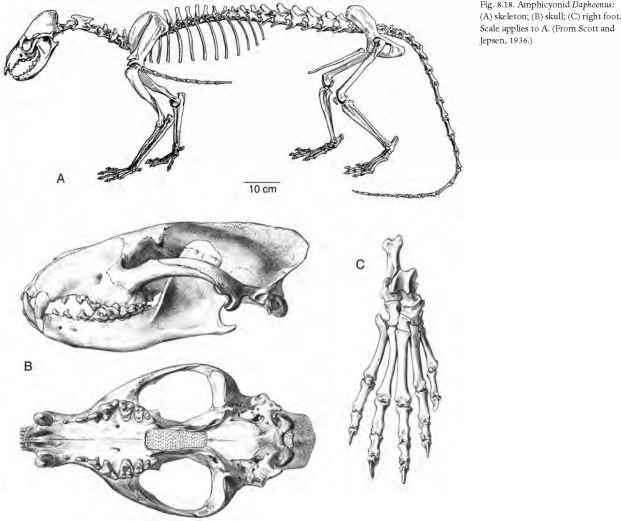 To mammalogists, Insectivora has usually been considered to include the living hedgehogs, moles, shrews, solenodons, tenrecs, golden moles, and their immediate fossil relatives, which are alternatively (and preferably) united as Lipotyphla (Fig. 9.1A). Anatomy provides weak support (a small number of characters) for a monophyletic Lipotyphla (e.g., Asher et al., 2003; Mussell, 2005). Molecular evidence, however, conflicts with the traditional concept of Lipotyphla and suggests that Lipotyphla is poly-phyletic (Fig. 9.1B), as further discussed below. Lipotyphlans are typically viewed as very primitive eutherians because they retain many plesiomorphic features, often including a basic tribosphenic molar pattern, but this pattern has been modified, sometimes substantially, in some families. Until fairly recently, tree shrews (Tupaiidae) and elephant shrews (Macroscelididae)—once grouped as Menotyphla—were also often included in the Insectivora (e.g., Romer, 1966; Vaughan, 1978), but they are now assigned to separate ordinal-level groups, Scandentia and Macroscelidea, respectively following Butler (1972). that they compose a monophyletic group with Lipotyphla. Consequently, an Insectivora of such broad composition is a true taxonomic wastebasket that cannot be defined or characterized except by retention of primitive eutherian features. Fortunately, most of these families are now assigned to other higher taxa, as they are in this book (see Chapters 7 and 10). Tenrecidae Superfamily Talpoidea5 fProscalopidae Talpidae fDimylidae Suborder SORICOMORPHA? Notes: Modified mostly after Novacek, 1986a; MacPhee and Novacek, 1993. The dagger (f) denotes extinct taxa. Families in boldface in this table are known from the Paleocene or Eocene. 1Named as a subfamily of Leptictidae. 2Sometimes considered a subfamily of Sespedectidae. 6 This taxon has also been used to unite Tenrecidae and Chrysochloridae. 7Probable synonym of Bobolestes; better considered a basal eutherian or possibly a zalambdalestoid (Archibald and Averianov, 2001; Averianov and Archibald, 2005). 8Assigned to Geolabididae by McKenna and Bell (1997). palaeoryctids are included under Cimolesta, following McKenna and Bell (1997).